Update: A U.S. Army major general was killed in the Afghan insider attack. A coalition official told Afghan media the officer, the highest-ranking member of the American military to die in hostilities surrounding the Afghanistan war, was shot at close range. A U.S. official has told the Associated Press "about a dozen" victims of an Afghan insider attack on Tuesday were Americans, with at least one killed. The official said the details of the attack remain unclear, however, and the number of casualties and injured victims could change. So far, the A.P. 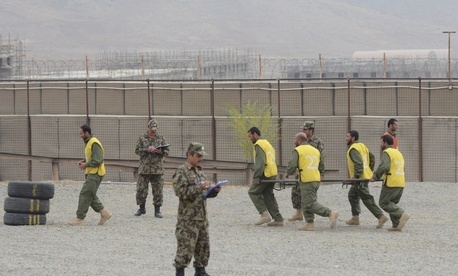 has reported that a man dressed in an Afghan army uniform opened fire on the NATO-led coalition at Camp Qargha, a base west of the capital of Kabul, wounding both Afghan and NATO troops. "We are investigating, but it appears that an Afghan army officer opened fire," General Mohammad Afzal Aman, the chief-of-staff for operations at the Afghan Defense Ministry, told The Guardian. "Three of our officers have been injured, some [NATO] troops have also suffered casualties." Defense Ministry Director of Operations Gen. Afzal Aman told CBS News the three senior Afghan officers included the Camp's commander Gen. Gulam Sakhi. Camp Qargha, funded by Britain, is modeled after the renowned Sandhurst British military academy and plays a major part in training Afghanistan's 350,000 security forces. The U.S.-led coalition plans to hand over combat operations by the end of 2014. According to The New York Times, Tuesday's shooting at the military academy was the first insider attack of its kind in Afghanistan in months. Attacks like these, in which Afghan troops would open fire on unsuspecting coalition forces, occurred frequently in 2012, with up to a dozen attacks over the course of the year. Though little details have been released and the number of casualties remains unconfirmed, the U.K. Ministry of Defense said the incident is under investigation. Still, "it would be inappropriate to comment further at this time," it said in a statement. Meanwhile, in Afghanistan's eastern Paktia province, a guard committed a similar attack Tuesday by opening fire on NATO soldiers close to the governor's compound,Paktia police chief Zulmai Oryakhail told CBS News. The guard who opened fire died of wounds, while an ISAF soldier was taken to the hospital.